Kathy Hinde has animated delicate origami Cranes using small motors. They fly to a soundtrack by Norwegian composer Maja S. K. Ratkje. The speed of their flight, and the intensity of the overlaying crane sounds is controlled by data that represents their annual migration cycle. 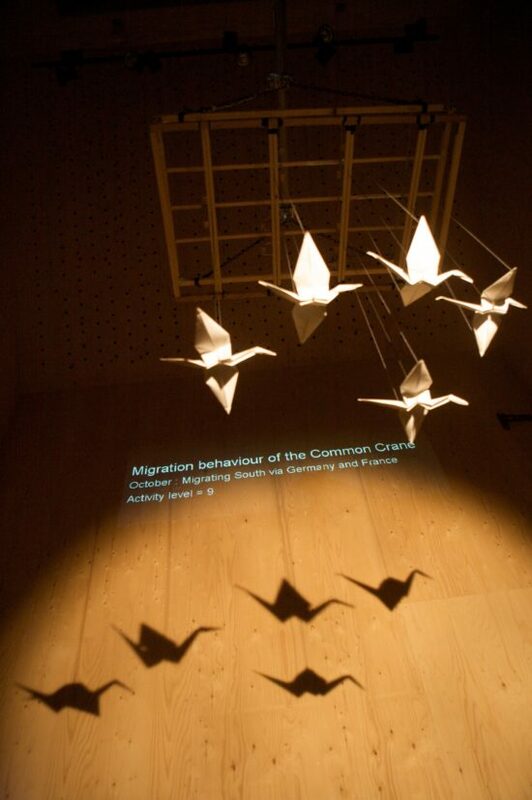 Video images shine onto the paper birds to create a super-imposed shadow animation. First shown on a Faster Than Sound residency, Snape, UK, 20th March 2010 as a part of the bigger work Birds and Traces . MaxMSP programming by Matthew Olden. With thanks to Peter Holden and Snape RSPB volunteers for information on Cranes and migration routes. Dancing Cranes by Kathy Hinde and Maja Ratkje from Kathy Hinde on Vimeo. This entry was posted in Multimedia/Installations and tagged Ratkje/Hinde. Bookmark the permalink.